Okay, I am now officially 0 for 2 with the Momofuku cookbook, so it's time to make a teeny tiny confession. I don't really like the food I've had at Momofuku and Ssam Bar all that much. I tend to blame myself rather than the recipe when something comes out kind of meh, but I'm starting to think my tastebuds just don't work the way David Chang's do. For example, when I cook super-intricate restaurant food the way Suzanne Goin tells me to, I pretty much want to lick the plate in an extremely un-ladylike manner. I stand by my comment that Momofuku is the single most entertaining cookbook I've ever read, but the recipes are not really rocking my world so far. 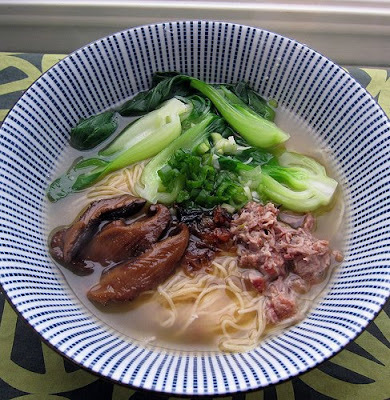 In fact, the ramen broth, despite the fact that it took a whole freaking day to make, was strangely less palatable to me than my super-simple pork broth. Something about the kombu and shitakes added a weird funky aftertaste that muddied the broth instead of adding depth. ...Anyway. I made it. The Momofuku ramen. I admit, I did not take the extra step and make the tare. One thing I'll say is that this project left me with a fridge full of great leftovers: shiitake pickles, a poached chicken, shredded pork bone meat that I've earmarked for my long-planned meat pie project (the leftover pork would be also great fried up in a breakfast hash, or popped into tortillas, taco-style), not to mention boatloads of homemade soup broth. Always a welcome thing. It's important to note that this is not a difficult recipe, just a time-consuming one. If you know how to boil water, that's basically all this is. Also, despite my kvetching above, this is a perfectly tasty bowl of noodles. I'll take it over Top Ramen any day. 1. Fill a large stockpot with 6 quarts of water and the kombu and bring to a boil. Immediately shut the heat off and let the kombu soak in the hot water for ten minutes. After ten minutes have passed, remove the kombu. You can save this for a kombu/bamboo shoot salad that Chang describes elsewhere in the book. 2. Next, throw in the shiitakes, bring water back to a boil, then turn the heat down and let these simmer for about half an hour. The shiitakes should be all plumped up when you remove them, and you can make a fairly quick pickle with them. Per Chang's instructions: Remove and discard the shiitake stems and cut the caps into slices. Heat these in a saucepan with the following ingredients: ½ cup of sugar (I did a touch less), ½ cup of sherry vinegar, ½ cup of light soy sauce, 3-inch piece of peeled ginger. Simmer for about half an hour. Let cool. You can eat right away, or place in an airtight container in your refrigerator for up to a month. 3. Preheat your oven to 400 degrees. 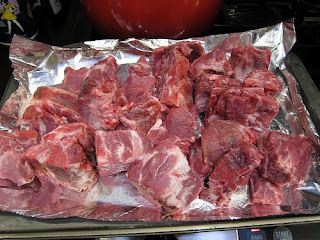 Arrange the pork bones on a cookie sheet or baking pan. Put them in the oven at about the same time you add the chicken to the broth. (Both take about an hour). About half an hour into the cooking, turn the bones to ensure even browning. 4. Chicken time! Plop the entire chicken into the broth, making sure it's completely covered by liquid (top it off with water if not). Bring to a boil and skim off any scum that appears. Turn the heat to medium low and simmer this for about an hour. Chang doesn't say anything about what to do with the cooked chicken, but I rinsed it under cold water (to keep the texture silky) and turned half of it into drunken chicken. To do this, poke holes in the cooked chicken flesh using a fork and pour about half a cup of Chinese rice wine over it. Scatter some sea salt and sliced scallions on top. The other half, I ate with just habanero hot sauce drizzled over. Poached chicken is also great in chicken salad. 5. Now add the pork bones and bacon into the broth. You know the drill. Bring to a boil, then simmer, skimming scum off as necessary. After 45 minutes, fish out the bacon. I was not clever enough to find a use for boiled bacon, so I discarded it. If that seems wasteful to you, check out the genius bacon waffle at Momofuku for 2. Five hours of slow simmering later, throw the onion, scallions, and carrots into the broth for the final 45 minutes. Lastly, season the soup with soy and/or salt. Strain the broth. Save the meat from the pork bones for other uses. This is pretty straightforward. Boil some storebought noodles and add toppings of your choice. To make it extra-authentic, make sure you drop the f-bomb a couple of times while you eat it. im glad i bumped into your blog.. and i can already tell that ill be visitng more often... great posts you have here! @Malou, Cute blog name! I look forward to reading about any Momofuku experiments of yours on there. @Gabriella, Thanks for the kind words! P.S., I bought these ramen noodles at the store. When David Chang says something is too much effort to make from scratch, I listen. But I did make the noodles for my niu rou mian recipe. Yes, I've always thought the Momofuku ramen was always too salty. But generally I've enjoyed some meals there. They try some creative things that are interesting. I like the Milk Bar cookies but the cakes are too sweet for me. And I have yet to try Ssam. I should probably dust off my Momofuku cookbook for some nice reading at some point, but I'm afraid it will make me very hungry. 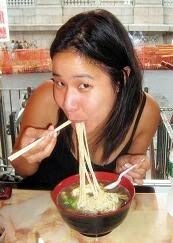 That ramen looks really good! I'm sure he could. I've never claimed to be anywhere near the level of a pro. I'm only reporting on my experience as a home cook following his recipe.